RemokonWatch Free is a MIDI and OSC (Open Sound Control) compatible wireless control application. You can send MIDI/OSC messages by tapping the controls on your Apple Watch as below. Any CoreMIDI compatible applications/devices can be used including Virtual MIDI, Network MIDI and physical MIDI interfaces. MIDI is supported on RemokonWatch Free 1.1.0 and later. You can also use any OSC compatible applications such as Max, SuperCollider, QuartzComposer and so on. Connect your Apple Watch-paired iOS device and the other device (i.e. Mac) to the same Wi-Fi local network. The OSC message will be sent to all devices as a broadcasting. The input port number of a host application should be 57120. 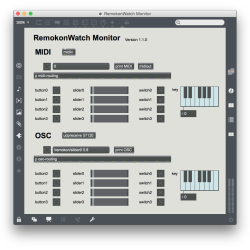 We have tried the Remokon Monitor MaxMSP application, but we are not receiving any messages from udpreceive. The Touch Monitor on RemokonWatch works, but no messages are sent to the mac. Is there anyway to check if messages are being sent over the network. I checked it this morning and it works fine for me. Are your iPhone and Mac on the same network? Is the udp port 57120 opened on your network? Is’nt any other app using udp 57120 running? You can use ‘Packet Sender’ on your mac to check the udp packets. I cannot make remokon communicate with the midi Apps on my iPhone 7!